Keywords: Lymphovenous leg ulcers; venous disease; oedema; multi-layer compression bandaging; self-management. Accurate assessment and diagnosis is the starting point for the treatment of chronic leg ulcers. Multi-layer compression bandaging plays a vital role in the treatment of lymphovenous leg ulcers and management of oedema. Enabling patients to actively participate in the management of their lifestyle and condition maximises the opportunities for improving quality of life and long-term maintenance. This short case report describes the assessment and diagnosis of venous disease in a patient with chronic leg ulcers. By detailing the management regimen it shows how involving patients in their treatment and care, and enabling them to take greater control over their condition, is crucial to the maintenance of long-term improvements. Rory Crabbe (not the patient's real name) was referred to the community leg ulcer clinic by his practice nurse. He is in his late 40s, married and has a young son. Two years ago he fractured his left leg in a motorcycle accident and was treated for a deep vein thrombosis (DVT) that developed in it afterwards. Eight months ago he also sustained electrical burns to both his legs and had skin grafts to help heal the wounds. The grafts on his left leg failed, leaving him with several ulcers on the upper part of the lower leg, the popliteal fossa and thigh. Over the last five months his left leg increased in size, restricting his mobility, and the ulcers coalesced to become a large wound [Figure 1]. During this period he also had two episodes of wound infection that required short courses of broad-spectrum antibiotics. Figure 1 - The extent of ulceration on presentation at the leg ulcer clinic. Several factors in Mr Crabbe's medical history indicated the presence of venous disease. Past trauma, immobility and DVT are contributory factors for venous insufficiency . Subsequent weight gain and a fairly sedentary occupation also contributed to increased intra-abdominal pressure, which negatively affects venous return to the heart . On presentation varicose veins were noted in the lower leg and thigh, as well as brownish discoloration in the gaiter area of the leg. Oedema was present in the toes, foot, lower leg and mid-thigh. The oedema was predominantly non-pitting, the skin on the lower leg was very dry and there were signs of increased skin folds in the lower part of the limb. Stemmer's sign (a thickened skin fold at the base of the second toe) was positive, indicating lymphatic insufficiency . Mr Crabbe has never smoked and had no previous history of cardiovascular disease. Blood glucose was 6.9mmol and a full blood screen revealed no abnormalities. Assessment of arterial status using Doppler ultrasound indicated there was good triphasic flow in all the vessels of his left leg and therefore no significant arterial disease [Table 1]. Venous assessment using photoplethysmography revealed incompetence in both the long and short saphenous veins with a refill time of more than 25 seconds. Ankle function was also observed to be limited in the affected leg. A combination of superficial and deep vein incompetence as well as limited ankle mobility will dramatically reduce venous return and negatively affect ulcer healing . In addition, it is important for patients to be active participants in managing their own healthcare . Mr Crabbe found it difficult to fit frequent visits to the surgery for dressing changes into his work schedule and wanted greater control over the management of his condition. The treatment regimen was based on the problems identified in the initial assessment and was agreed between the nurse and Mr Crabbe. Venous and lymphatic insufficiency were largely responsible for the misshapen, oedematous appearance of his left leg and the accompanying skin changes that were apparent on the limb [Figure 2]. It is important to control oedema as it can delay ulcer healing . 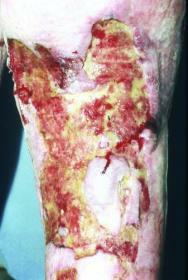 Figure 2 - Lymphovenous leg ulceration with limb distortion. Excessive exudate was also a significant problem. Control of the exudate was partially achieved through the use of a hydrofibre dressing as the wound contact material. Further management involved the use of compression bandaging using a multi-layer short-stretch bandaging system. A conforming bandage was applied to the toes to reduce swelling in that area. In line with Mr Crabbe's need for greater control over the management of his condition and to reduce the frequency of his visits to the leg ulcer clinic, a regimen was devised that involved appropriate cleansing and skin hydration using paraffin-based emollients. He was reminded of the risk of secondary infection and provided with information on hygienic measures that could help to prevent infection. He was also shown how to monitor for signs of infection at the ulcer site and for fungal infection between the toes. Both he and his wife were taught to apply the bandages, and Mr Crabbe found that wearing spandex shorts helped to prevent slippage. Self-bandaging also enabled improved management of the wound exudate. Movement and exercise were an integral part of the treatment regimen, particularly while wearing compression bandages. Mr Crabbe began a daily exercise routine using a stationary bike and followed a weight reduction programme. He also performed specific exercises that had been recommended by a physiotherapist to improve ankle function. A weight loss of 10kg and a reduction in oedema resulted in an overall improvement in gait. Initially progress was monitored monthly, later every three months, at the community clinic. The contact details of the patient support group were provided as both Mr Crabbe and his wife wanted more practical information on the management of his condition. He became very skilled in the application of his bandages and was able to adapt the system, sometimes alternating bandage application with wearing hosiery. The sense of greater control over his condition eventually enabled the family to go on holiday. Ulceration resulting from lymphovenous disease may require long-term management to prevent recurrence. This case highlights the importance of early patient involvement in the management of this type of chronic non-healing ulcer. Appropriate intervention and support from healthcare professionals can also enable patients to maintain a healthy lifestyle and make better use of healthcare resources. 1. Callam MJ, Harper DR, Dale JJ, Ruckley CV. Chronic ulcer of the leg: clinical history. Br Med J (Clin Res Ed) 1987; 294(6584): 1389-91. 2. Adhikari A, Criqui MH, Wooll V et al. The epidemiology of chronic venous disease. Phlebology 2000; 15: 2-18. 3. Browse N, Burnand KG, Mortimer PS. Diseases of the Lymphatics. London: Hodder Arnold, 2003. 4. Moffatt CJ, Franks PJ. A prerequisite underlining the treatment programme. Risk factors associated with venous disease. Prof Nurse 1994; 9(9): 637-40, 642. 5. Wanless D. Securing Our Future Health: Taking a Long-Term View. Final Report. London: HM Treasury, 2002. 6. Prasad A, Ali-Khan A, Mortimer PS. Leg ulcers and oedema: a study exploring the prevalence, aetiology and possible significance of oedema in venous ulcers. Phlebology 1990; 5: 181-87.